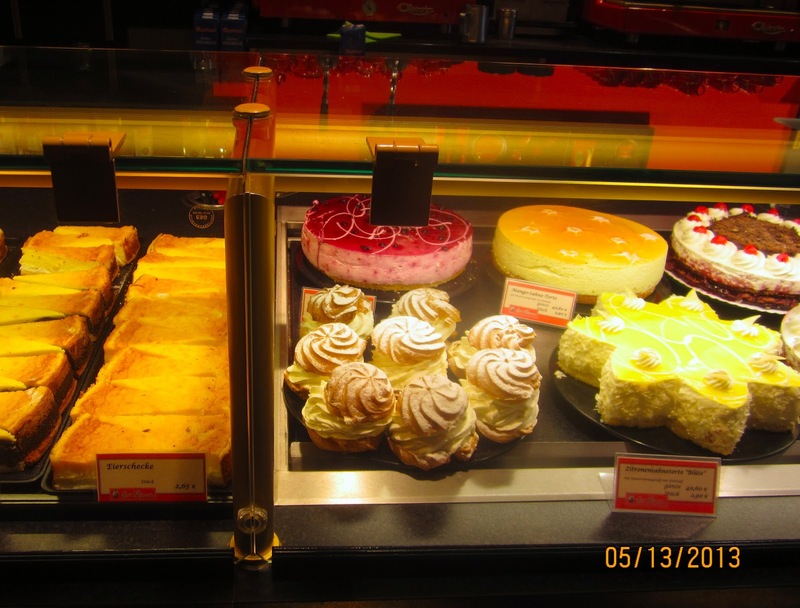 The first time I heard about a cake called “Eierschecke”, when I saw my cousin Uta’s post in facebook. “Eier” is the German term for eggs, and “Schnecke” (snail)) is a common name for pinwheel shaped pastry, but I had not the slightest idea what “Schecke” meant, or where it might come from. I looked it up at Wikipedia, and learned that this specialty from Thuringia and Saxony was named for a three tiered, medieval tunic for men. The cake had, obviously, three layers: crust, quark filling with apples or poppy seed, plus a custard topping. 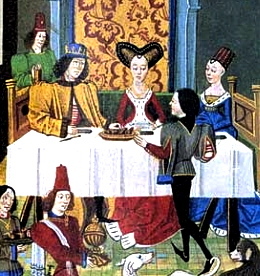 Medieval schecke – male predecessor of the mini skirt? I had never visited Dresden before, but in May we went on a trip to Saxony, and there it was: every bakery offered Schecke, subspecies Dresdner Eierschecke. It came in many variations, yeasted dough or sweet crust, raisin-studded or not, baked as bar or torte. My husband always gets this devout look in his face when he enters a German bakery. I, of course, view it also as continuing education, and sample solely for scientific purposes. Faithful to the Anderson credo: “Life is Uncertain – Eat the Dessert First!” we conducted a thorough investigation. As a result of this extensive field work, I looked for a recipe, soon as we were home. 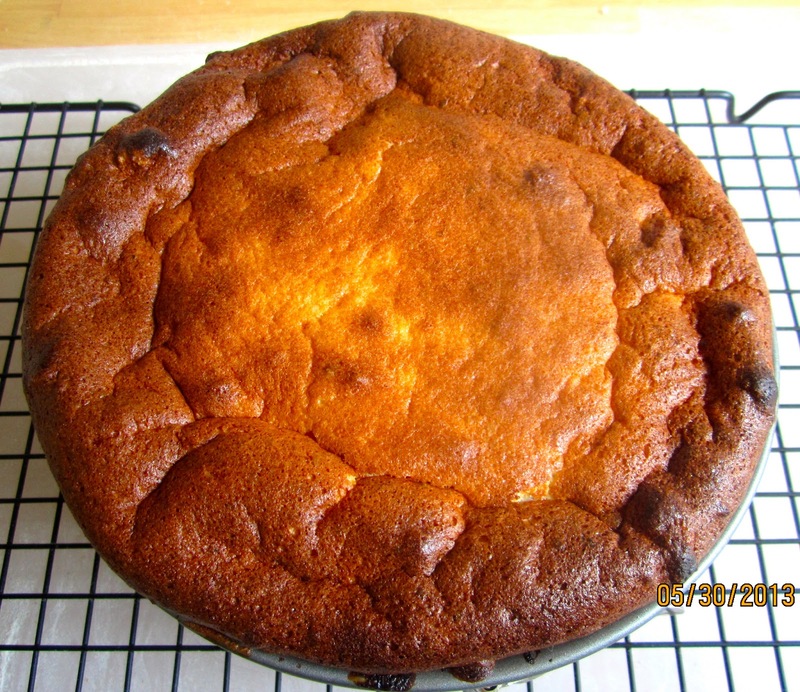 I’m no great friend of raisins, and don’t like it too sweet, therefore I wanted my cake to be a bit tart and fruity. You can get apples, a classic Schecke ingredient, all year long, but now it was rhubarb season, and I had some in my fridge. So I entered “Eierschecke” and “Rhabarber” (rhubarb) in Google’s search box, and promptly struck gold. This recipe, posted by Thomas (Tolotika) in kochbar.de, was the one I liked best. 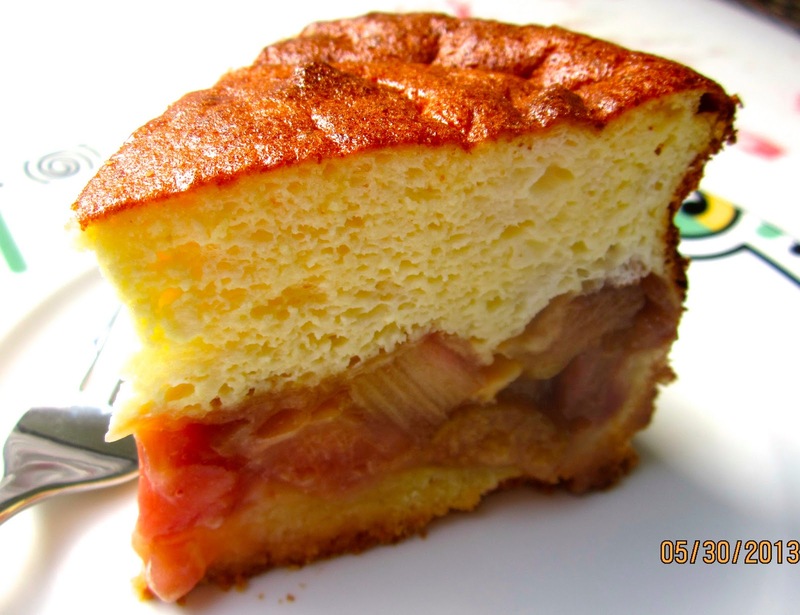 It had a sweet crust, the rhubarb sauce was thickened with vanilla pudding powder, and the custard not only contained eggs, sour cream and pudding, but also quark. Much as I love quark – it’s almost impossible to find in the US, and even if you do, it is outrageously expensive and doesn’t taste the same. Therefore I use for my German Cheesecake cream cheese as stand-in. Mixed with lemon juice and whipped egg white, it comes closest to quark in taste and consistency. I reduced the amount of sugar in the custard by half, but the cake is still sweet enough. There was another problem to solve. Though Richard and I like to eat cake, it’s only the two of us, and I couldn’t imagine that the airy egg mixture on top of the fruit layer would last several days without getting soggy. 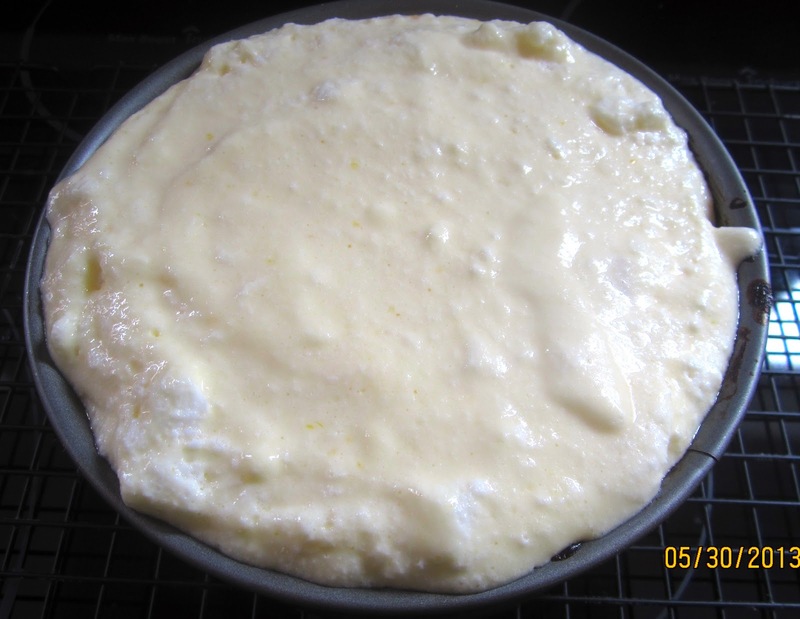 To convert a recipe for a 10-inch/26-cm diameter torte to a 7-inch/18-cm tortelet, you enter the pan size of the recipe and your desired pan size in Keiko’s pan conversion tool and, voilà, there is the factor you need (0.48)! Now grab your calculator and multiply each recipe ingredient with 0.48. The result was everything I had looked for! The tangy rhubarb makes a pleasant contrast to the sweet custard, and the whole thing is so airy and fluffy that I’m sure it doesn’t have a single calorie! *) How to divide an egg into halves? It’s easy: on a scale, crack an egg into a cup, stir well, and then take off half with a spoon. 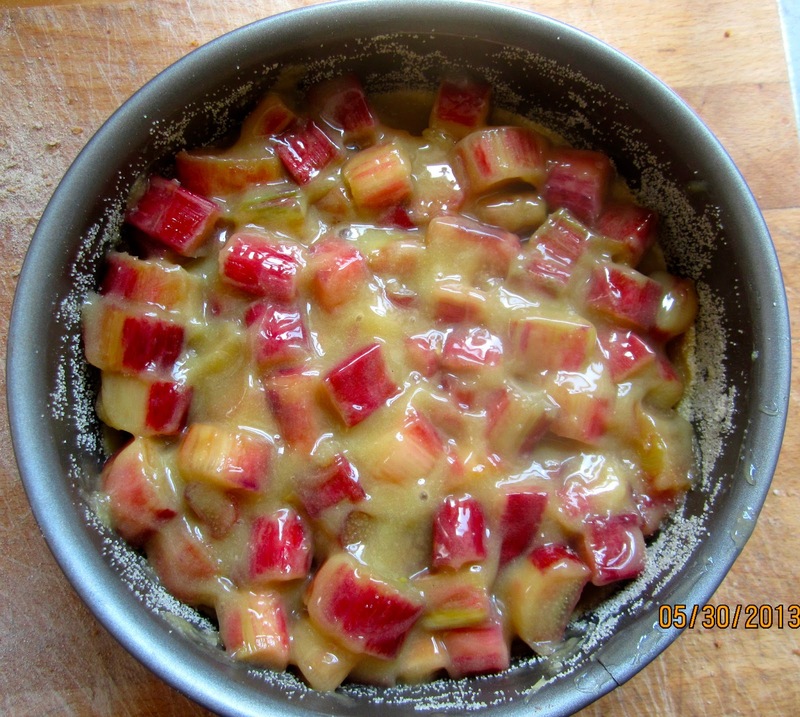 In a bowl, stir together rhubarb and sugar. Mix well. Cover, and leave overnight at room temperature. 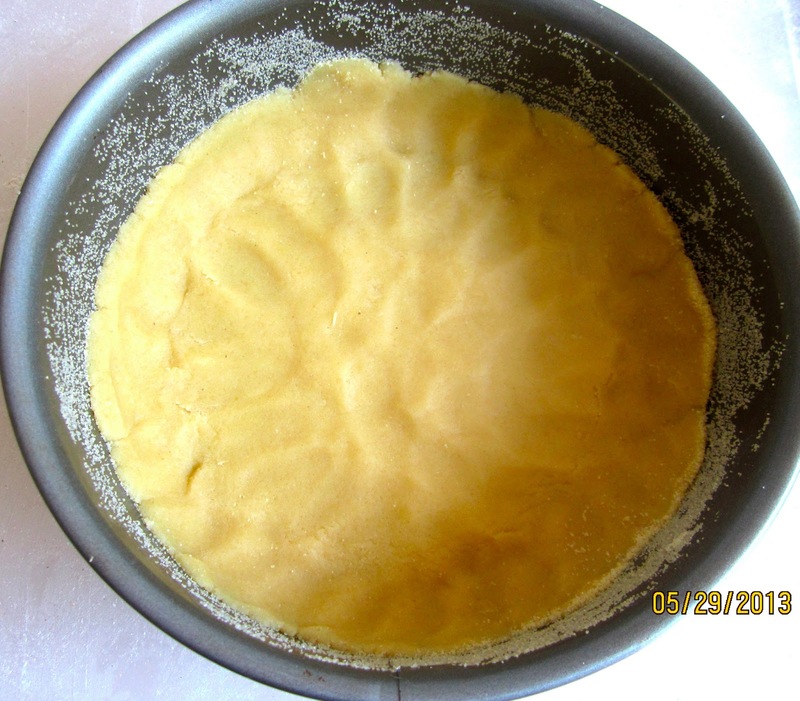 Grease a 7-inch/18-cm diameter springform, and sprinkle with semolina. 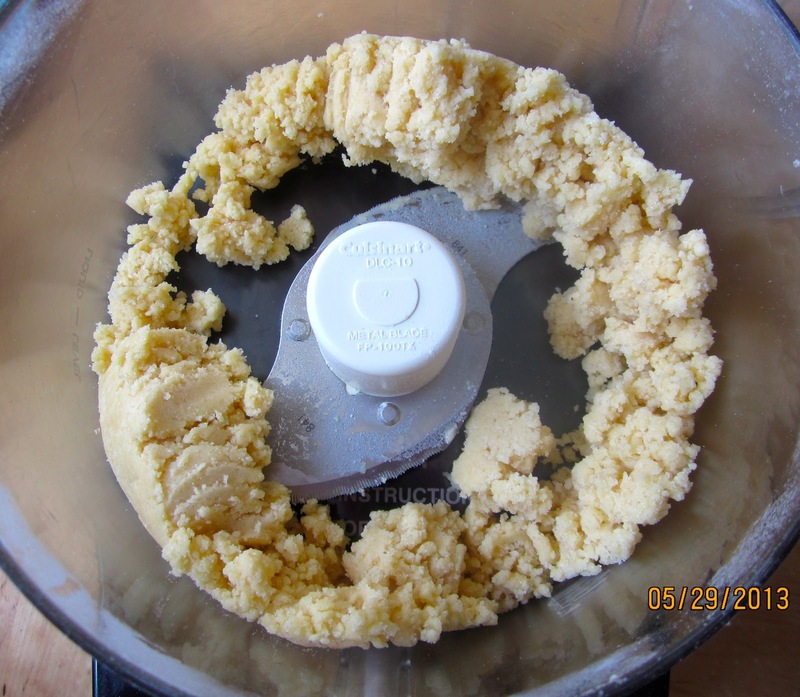 Food Processor: Briefly pulse flour with baking powder and sugar to combine. Add egg and butter pieces. Pulse, until mixture comes together, and no loose flour remains on the bottom of the bowl. Or knead all ingredients by hand, or with a handheld mixer. Shape dough into a ball, flatten into a disk, transfer to prepared springform pan, and press into bottom, making a small rim around the sides. Refrigerate, until ready to fill. Preheat oven to 435ºF/225ºC. Place rack on middle rung. Following instructions on the package, prepare vanilla pudding with pudding powder and reserved rhubarb juice. Add rhubarb, and stir well. Leave mixture to cool a little bit. Pre-bake cake for about 25 minutes. Remove from oven. Reduce oven temperature to 410ºF/210º. For the custard, beat cream cheese, sour cream and sugar, until well combined. Add egg yolks, one by one, and mix to incorporate. Mix in lemon juice and zest. 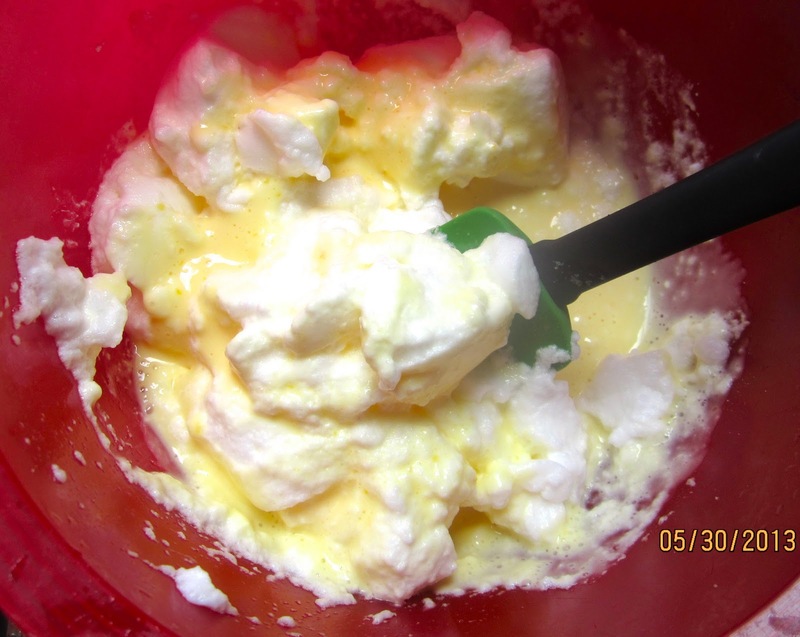 Whisk egg whites until soft peaks form. Fold egg whites in egg/cream mixture. Pour Eierschecke custard over pre-baked torte and smooth with plastic spatula. Bake torte for about 20 minutes, or until set (but elastic to touch.) Leave for at least 15 minutes in switched-off oven with door slightly ajar. Freshly baked, the Eierschecke-Torte looks like cheese cake. Or, like the greedy Andersons, eat it while it is still warm!!! 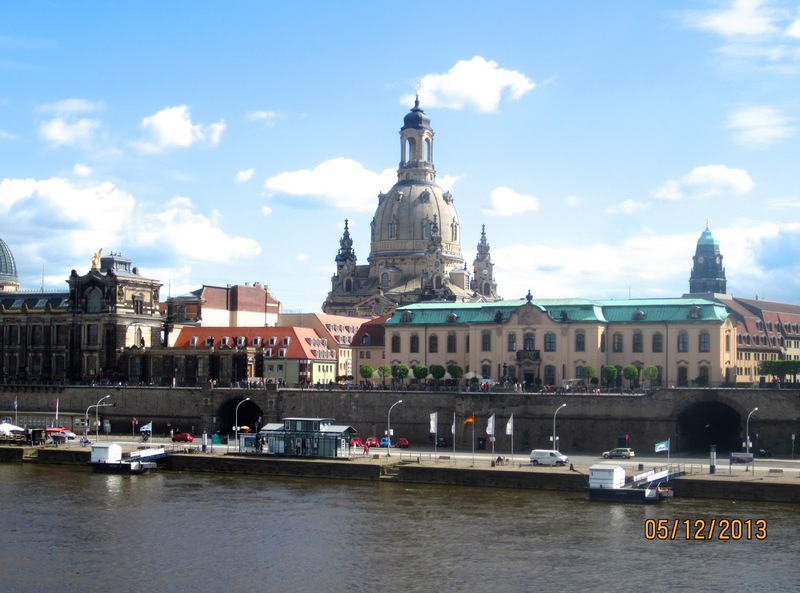 Beautiful Dresden is really worth a trip – not just for the famous Eierschecke! Previous Post BACON-CHEDDAR-CHIVE SCONES – A WONDERFUL SURPRISE! Next Post BLUEBERRY HAND PIES – OTHER FRUITS WELCOME! Your photo makes your Torte so warm and welcoming too! Thanks, Joanne! I hope you feel invited to try the torte. I assume you have rhubarb in Australia, too? Do try this out, Hanaâ! If you want to make a larger (10-inch) version, check the original recipe at kochbar.de. I am so impressed by the philosoply and by the conversion factor and I love rhubarb and this looks superb. What a wonderful and very German looking cake. I told OH what your philosophy was and says it is very similar to his, which is something like 'if there is cake it makes a better lunch than a sandwich'. We don't have 'pudding' in England, I am sure I can get it from an American importer but we do have Birds Custard powder, do you think that would work, presumably it is a thickener of some sort, like cornflour? Yes, I can agree to that philosophy, too! I googled Bird's Custard after reading a post by Dan Lepard in the Guardian, and I'm sure you can use it just the same. You don't need much, anyway, and it is just an easier and more flavorful way to thicken the rhubarb juice. I used the German Dr. Oetker vanilla pudding powder that I can get here in the supermarket. What a lovely recipe! Like you I love the layers of history in the food we eat. Great pictures too! They make it really easy to try and replicate the dessert at home. I will try it with rhubarb I have in the freezer left over from last year. Thanks, Karin! It was fun to write this post. I have some rhubarb (and Italian plums) from last year in my freezer, too. The combination of sweet and tart is always nice.